Stretch Break: Stand up. Raise your right hand straight up overhead and then lower it behind your upper back. 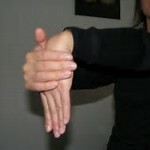 At the same time, move your left hand down and behind your back, then up to grasp your right hand. Hold for 3 deep breaths, and then release. Repeat with your left hand up and over, and your right hand down and back. Make a loose fist with each hand, and then release. Do 5-8 times. 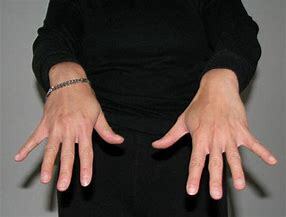 Squeeze your fingers together (keeping your fingers straight), then separate 5-8 times. Curl in your fingertips only, then straighten. Do 5-8 times. Been sitting a lot? Stretch your hamstrings a lot! Begin standing, facing a step or chair. Place your right foot up on the chair. Keeping your back straight, bend forward slightly from your hips. Hold for 10-30 seconds, then release. Repeat the stretch placing your left foot up on the chair. Bend forward from your hips, hold for 10-30 seconds, then release. Do this stretch for runners after your next workout. Begin standing and pull your right foot up in front of your belly button. Move your right knee to the side of your body. Hold your lower leg and ankle with both hands, keeping your lower leg parallel to the floor. Keep your torso straight and shoulders back. Hold for 10-30 seconds, then release. Repeat pulling your left foot up in front of your body. Using both hands hold your left calf and ankle, letting your knee fall to the side. Hold for 10-30 seconds, then release. *Consult your physician before beginning exercise. This stretch is for those without injury concerns. Computer stretch for your hands. 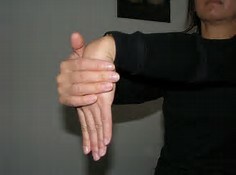 Extend one arm straight out in front of you with your palm facing down. Pull your shoulders down and back. Gently curl your fingers in and bend your wrist down. Hold for a count of 10, then release. Repeat with your other arm. Stand Up Straight with this Stretch! Stretch your Chest and Front Shoulder! Stand up. Place your right hand on the wall or door frame slightly lower than shoulder level. 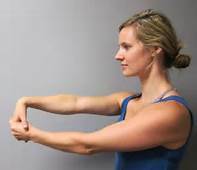 Keep your elbow straight, and gently turn your body away from your hand. Pull your right shoulder down and back feeling a stretch across your chest and front shoulder. Hold for 10 seconds, then release. Repeat the stretch placing your left hand on the wall or door frame. Stretching your chest and front shoulder allows for proper posture. This means you stand up straight, longer! Proper posture reduces muscle tension and stress that comes from slouching. Taking regular stand up stretching breaks during your day reminds your body of neutral or a properly aligned body position. You’ll have more energy and feel better!